This is the fifth in a TECHknittng series about buttonholes for hand knitters. 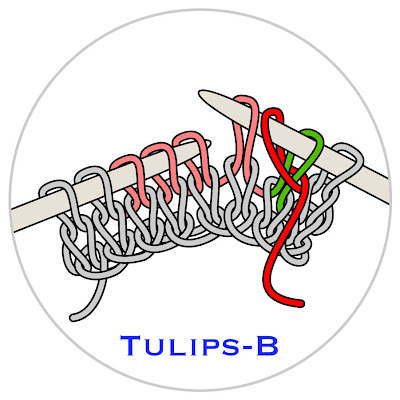 * The first half of the post shows a traditional horizontal buttonhole; the second half shows an improved horizontal buttonhole called the "tulips" buttonhole, and includes, not just illustrations, but also a link to a video how-to. 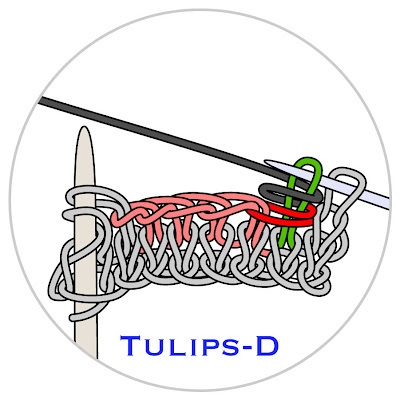 Row 1: Cast off several stitches using the chain bind-off (in the below diagram, 3 sts are cast off, shown in red). Slip last chain to L needle. Next, use the running yarn to cast that same number onto the R needle, using a backwards loop cast-on (shown in gray). After cast on, knit sts on L needle, then turn work. Row 2: On the next row, every stitch is knit, including the looped cast ons, and voilà: the buttonhole is made. As you can see, the simple horizontal buttonhole is neither sturdy nor beautiful. The lower right corner is particularly prone to stretching out and the buttonhole itself is asymmetrical top-to-bottom as well as side-to-side. To combat these deficiencies, traditional knitters added reinforcement via the buttonhole stitch (as shown on the simple vertical buttonhole, previous post in this series). This strengthens the edges, and hides them, too. Yet, sewing is something of a pain in the neck. It also looks clunky. So, here's TECHknitting's improved "tulips" horizontal buttonhole introduced last year. Tulips is self-reinforcing and symmetrical, requiring no touch-up with the sewing needle. 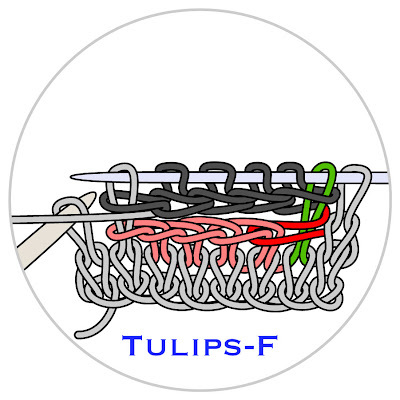 The editor of Interweave Knits, Eunny Jang, made a video about the tulips buttonhole, and you might want to follow along with the video as well as the diagrams--tulips is a bit difficult to work the first few times, because it uses techniques not usually found in knitting. You can click the link above to view via you-tube, or there is a direct link at the bottom of this post. Oh, and before we get to the nitty gritty, the name "Tulips" came about because in stockinette, the buttonhole looks like TWO LIPS. However, in garter stitch or other textured stitches, this buttonhole looks quite refined, as Eunny's video shows. I've written these instructions as though you were going to make an 8-stitch-wide practice swatch. Once you get the process, you'll see that a minimum of 7 stitches is required (three for the buttonhole itself, and two on each side) but there is no maximum number. Step1: set up to bind off. Using dpn’s, knit several rows in stockinette, end purl row, turn work. Next row: Knit 1. Wrap running yarn (red) clockwise around next st (green) as follows * Bring yarn to front. Slip st to R needle, bring yarn to back, return st to L needle, bring yarn to front again. Return st to R needle. 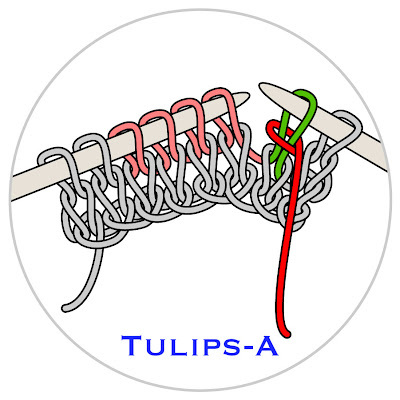 * Per illustration Tulips-A, the green st at the working tip of the R needle now has the running yarn wrapped clockwise around its neck but it has not been knit. Drop the running yarn, it will not be used again until step 3. Step 2: bind off bottom edge. 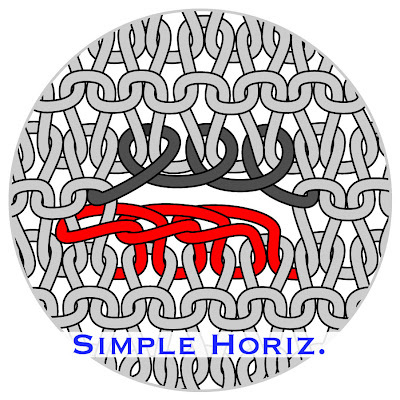 With L needle, snag the loop you just made, draw it up, untwisted then slip it onto R needle. Next, slip a stitch from L to R needle. 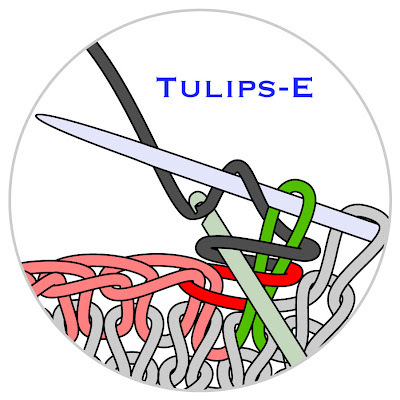 As shown on illustration B, counting the drawn-up loop, there are now 4 sts on R needle. 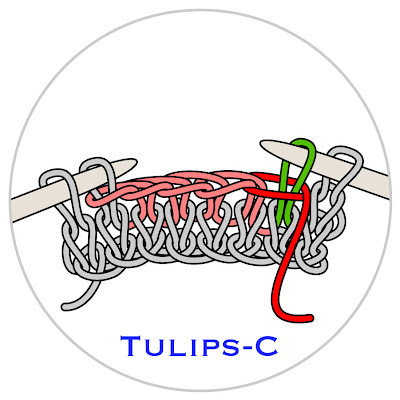 *With tip of L needle, draw the second stitch (red) over the stitch (pink) on the tip of the right needle—this is an ordinary chain bind off. Repeat from * until 1 st remains on the L needle. Slip the last st on R needle onto L needle to make two sets of 2 sts. As shown on illustration C, there are 2 sts on R needle, 2 sts on left needle, and a stretch of bound off stitches between the two groups. Step 3: set up to cast on. “Park” the L needle by shoving it upright anywhere through the left side of the fabric—now it’s out of the way and those stitches won’t slide. Slip the 2 sts on the R needle onto a dpn (light blue) at least 3 sizes smaller than the main needles. Now, unwrap the top leg of the red running yarn from the green st at the R needle tip, then re-wrap counterclockwise as follows: slip green st onto L needle. Slip the running yarn to the back and return the green st to the R needle. Draw the running yarn up firmly, but not so tight as to remove all slack. * Bring the yarn to the front. Return the green st to the L needle. This has re-oriented the red running yarn in front of the green stitch instead of behind. Now make the additional loop shown in gray as follows: bring the running yarn (now shown in dark gray) to the back, return the green st to the R needle, bring the yarn to the front again. One more time, slip the green stitch to the left needle, then bring the yarn to the back, then slip the green stitch to the right needle where it will finally remain, as shown in illustration D.
Do you see what you’ve done? You have actually crocheted a single crochet stitch (sc) with the upper leg of the sc wrapped around the needle. (You may have seen this before: this the same manuver as the provisional crocheted cast on, when that is worked around a knitting needle.) Repeat within the stars 3 times more for a total of 4 stitches cast on—6 stitches on your right needle and one loop on the crochet hook. Step 5: join cast on with bind off. Bring running yarn to front. Slide loop from the crochet hook onto R needle (7 loops on R needle). Put the crochet hook down and retrieve your left needle from parked position. Now slip the next st from the working tip of the L needle onto the R needle, 8 loops on R needle. Using tip of L needle, draw the second stitch from the R needle tip over the stitch on working R needle tip (chain bind off—7 loops on R needle, 1 loop on L needle). Illustration F.
Step 6: finish up and work back. Work the last st and turn the work. The buttonhole is finished (it is a 1-row buttonhole) but how you work back depends on what fabric you are creating. If you are making the buttonhole in stockinette fabric, you simply purl this entire next row. If, however, you are working in garter stitch, the next row is worked k2, p4, k2. If you are working any other patterned fabric (seed st, for example) you should swatch this both ways and see which you prefer. This improved horizontal buttonhole can be worked over more or fewer stitches, and the surrounding fabric can be (should be, actually) made wider because illustrations show only the minimum possible surrounding stitches—two on each side. PS #1: There is a new (September 2013) YO (eyelet) buttonhole which is reinforced using tricks similar to those used in Tulips. Have a look! Thanks to Ellen at at Pile of Sheep Blog for this new trick.